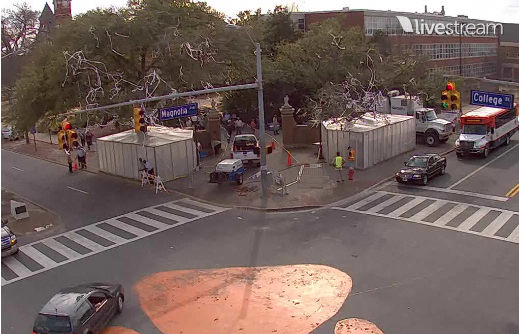 Tents placed around the base of the Toomer's oaks Monday as seen from the City of Auburn's Toomer's Corner webcam. Auburn officials have yet to decide whether to ask fans to refrain from rolling the dying oaks at Toomer’s Corner during the 2011 football season. Experts say the trees could take up to a year to die, unless their situation changes. A tarp was placed over the bedding area of the oaks Friday night to keep rainwater from going into the roots; a fence hung with signs asking fans to not roll the trees was also set up around the bedding area in anticipation of Saturday’s “Toomer’s Tree Hug” event. Clardy says the change in scenery at the corner is short term. Information on the progress of the task force commissioned to save the iconic oaks, as well as decisions for the future related to fan celebrations, will be announced at www.auburn.edu/oaks . On the bright side, hopefully, the scientific knowledge gained will benefit agronomy. I imagine Auburn’s efforts will prove more illuminating than even Dow’s tests on counteracting Spike 80DF. Certainly, Dow never experimented on trees this large and mature. Who knows, maybe a breakthrough in herbicide use & countermeasures will be discovered. Right now looks like we’re down 3 touchdowns and need a big play.